SCOTTSDALE, Ariz. – Jan. 25, 2016 – Barrett-Jackson, The World’s Greatest Collector Car Auctions®, has collaborated with leading luxury men’s fashion company, Robert Graham, to co-design a one-of-a-kind Barrett-Jackson 45th Anniversary shirt. The shirt, available in either white or black, is for purchase at merchandise booths at WestWorld of Scottsdale this week and also online at www.shopbarrettjackson.com. Robert Graham is an American eclectic lifestyle brand where craftsmanship, luxury and style intertwine – much like a fine collector car. Like the rarest of the collector cars, the Barrett-Jackson 45th Anniversary sport shirt is a Limited Edition. Only 480 of these special edition shirts were made. 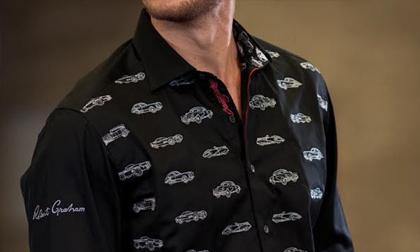 The solid sateen shirt features embroidered rare and collectible top-selling cars that Barrett-Jackson has had in its repertoire over the past 45 years. The Barrett-Jackson and 45th Anniversary logos are delicately embroidered on the back. Mother-of-pearl buttons complete the look on this 100% cotton, easy-to-wear shirt, and the interior cuffs and neckband are lined with a digital printed treatment of these iconic cars. For more information on the Limited Edition shirt, follow the link to www.shopbarrettjackson.com, or visit a merchandise booth at WestWorld of Scottsdale during the 45th Anniversary Scottsdale Auction, January 23-31. Established in 1971 and headquartered in Scottsdale, Arizona, Barrett-Jackson, The World’s Greatest Collector Car Auctions®, is the leader in collector car auctions and automotive lifestyle events. The company produces auctions in Scottsdale, Arizona; Palm Beach, Florida; at Mohegan Sun in Connecticut, and Las Vegas, Nevada. With broadcast partners, Velocity and Discovery Channel, Barrett-Jackson will feature live television coverage in 2016, including broadcasts in over 100 countries internationally.Barrett-Jackson also endorses a one-of-a-kind collector car insurance for collector vehicles and other valued belongings. For more information about Barrett-Jackson, visit http://www.barrett-jackson.com, or call 480-421-6694. Robert Graham represents the American Eclectic lifestyle brand-where craftsmanship, luxury and style intertwine. As a true design house since 2001, we’ve been inspiring fashion by developing unique garment-making techniques and complex textile patterns. Our creative seasonal collections encompass: men’s sportswear, premium denim, footwear, outerwear, lounge wear, accessories, and women’s sportswear. With eye-catching mixed fabrics, one-of-a-kind trims and stunning embroideries, Robert Graham embodies luxury at its finest. Each product is unique, character-filled and distinctly Robert Graham–with “knowledge, wisdom, truth” embedded in each garment.